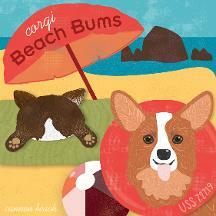 Nothing says summer fun like some fluffy Corgi Bums on the Beach. These fun Corgi Beach goers are letting it all hang out. Thanks to our designer Kate Schell at akateschell@gmail.com for these fun-loving designs. Strange sightings of Stumpy leg creatures have been reported in Cannon Beach. They are investigating Cannon Beach trying to understand the mystery of the Stumpy leg takeover…the Corgis are taking over!! Thanks to our designers Reina and Yuan-Wei Tan for the drawings. If you would like have them design for you contact reina.tan@gmail.com. 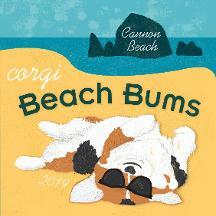 Get ready to cover your face as the “Sand Storm is coming!” Our 2017 theme is “The Corgi Storm.” Enjoy this design on a t-shirt, tote bag, beach pillow, and more. All profits benefit the Oregon Humane Society. 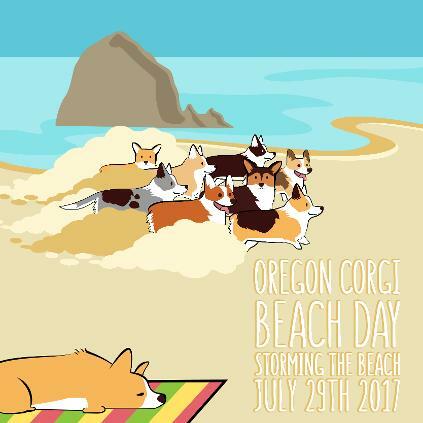 Watch out for the Corgi Sand Strom July 29th, 2017 in Cannon Beach, Oregon! 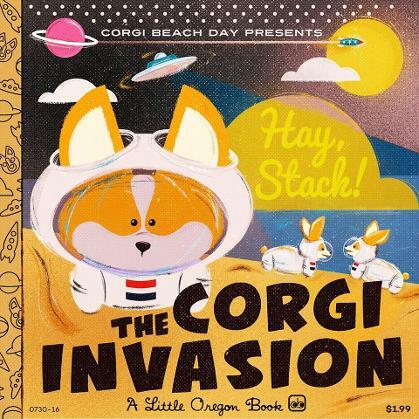 Set your phasers to “Adorable!” Our 2016 theme is “The Corgi Invasion,” and we’re celebrating it with a special tribute to Little Golden Books. Enjoy this retro classic on a t-shirt, tote bag, beach pillow, and more. All profits benefit the Oregon Humane Society. Warp Speed Ahead! Graphic for this year’s event thanks to Designer: Matt Christenson of www.50000watts.com. 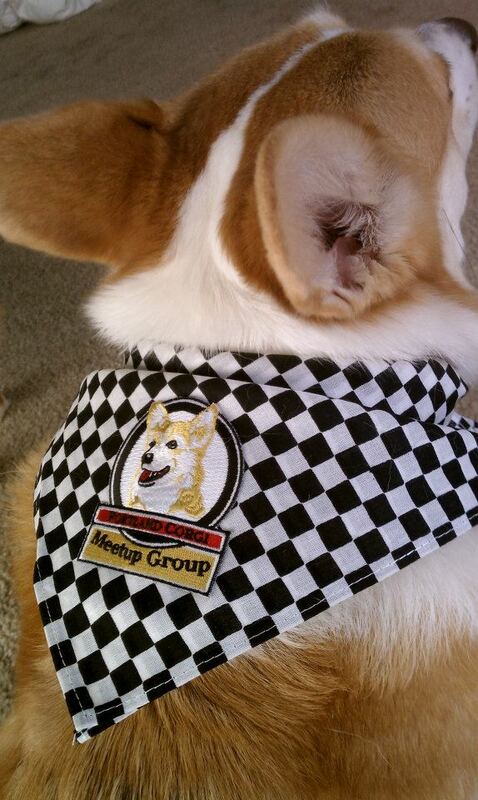 We all know Corgis enjoy their fun antics, and getting in trouble from time to time, these Corgis are no exception! Enjoy this fun filed Corgi “Cannon” Blast, on a t-shirt, tote bag, beach pillow, and more. All profits benefit the Oregon Humane Society. Watch out below! Portland is well known for it’s historic "White Stag sign", also known as the “Portland Oregon” sign. 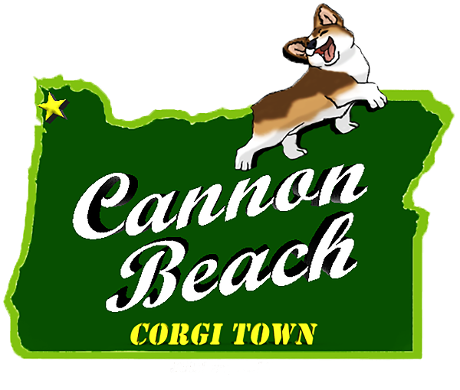 However, we all know Corgi’s do everything better, so for our annual Oregon Corgi Beach day event held in Cannon Beach, we thought it was time to dub the city “Corgi Town”. Hope you enjoy our version of this Historic Oregon Landmark! 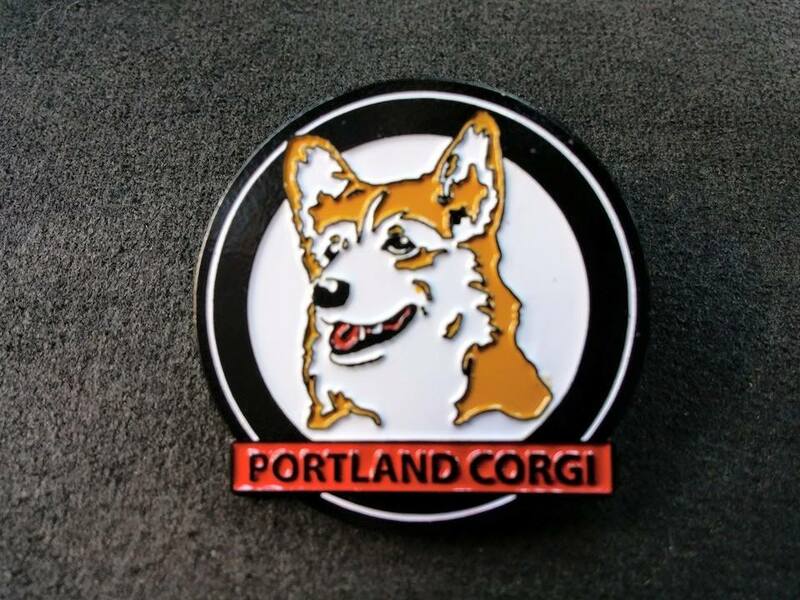 All profits benefit the Oregon Humane Society.